What are the major cyber security threats and challenges facing us in 2019 and beyond? What are the Federal Government’s primary roles and responsibilities? What is the Commonwealth of Virginia doing to tackle cyber security? Find the answers to these questions and more in this interesting podcast moderated by SSV president Rich DeMong. First download the view graphs that were presented. 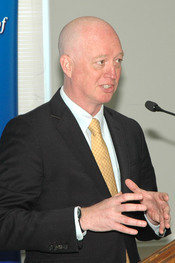 Thomas A. Dukes, Jr., is the Director of Strategic Initiatives for the Virginia National Guard, as well as an adjunct professor of cyber law and policy at the University of Virginia and the University of Tartu, Estonia. He previously served as the U.S. State Department’s Deputy Coordinator for Cyber Issues, as a senior trial attorney in the U.S. Justice Department’s Computer Crime and Intellectual Property Section, and as an active duty U.S. Air Force Judge Advocate. He earned a JD from the University of Virginia School of Law and a BA from the University of Maine at Farmington. Cybersecurity threats would include cyberespionage to seek political, economic and military advantage over the US, cyber enabled theft and extortion against US networks and US elections interference. The role of the US has been one of leadership in developing a strategy for managing cybersecurity. The global use of the internet has different countries having different thoughts on how this should be accomplished. US presidents have initiated several commissions to present a federal policy, but currently there is not one though individual states have their own. The UN has also tried to form a global policy, but without success. In principle all parties agree on the goal of an open, reliable and secure network. In speaking about Virginia specifically, the state government has several cybersecurity initiatives: Cybersecurity Strategy (2016), cyberva.virginia.gov, Virginia Information Technology Agency (VITA) , Attorney General of Virginia, Virginia Dept of Public Safety, VA National Guard and VA Department of Emergency Management. The internet has radically changed our world and it is important to remember how young this field of technology really is. On June 29,2007 the first iPhone was released. Cybersecurity is an evolving field trying to maintain a balance between freedom and safety.